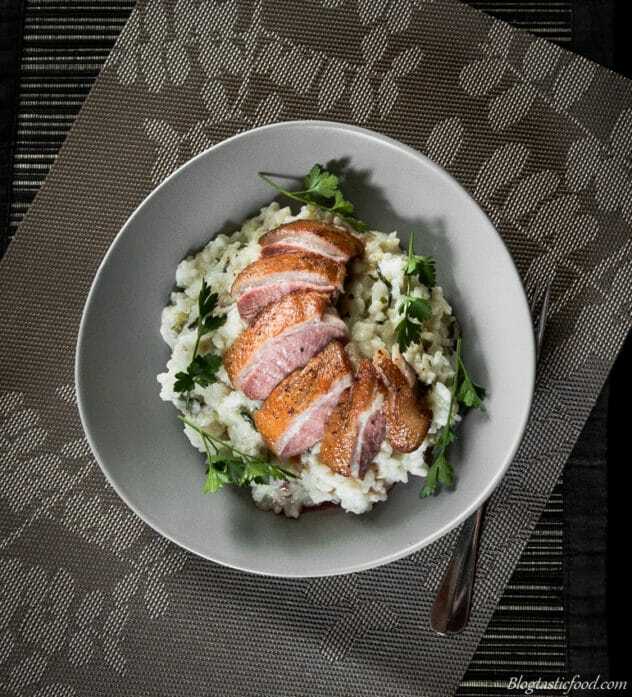 Ok, my fellow humans, pan-seared duck on risotto. Just saying it sounds a bit cheffy and classy doesn’t it? Perhaps something you may want to cook for a date night to impress your Mr or Mrs but fear not, just prep those ingredients, follow the recipe and you’ll be absolutely fine. And the great thing about risotto is that when you have made it well once, you realise how it isn’t as difficult as it seems. What I usually do is just use the 3:1 method. 3 times more stock to rice, although I keep just a bit of extra stock just in case. Once you know how to make risotto Bianco. 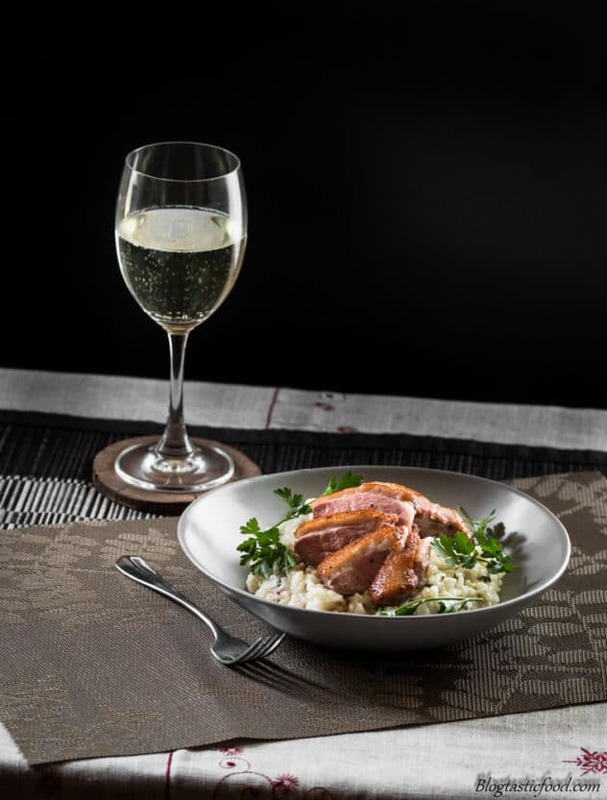 Which is the classic, base risotto recipe. You can add whatever you want to it afterwards. So you can imagine that making a risotto recipe wouldn’t be all that difficult, especially due to the fact that I have made it so many times. Although what is new to me, is the pan-seared duck breast. 9 times out of 10, when I have duck it is an Asian inspired dish. So it was really fun to try something new. But what do you guys think of duck? It is certainly one of my favourite meats. I always get excited whenever I see peeking duck in a restaurant. However, it is a bit more of a fatty, rich and gamy meat than chicken or turkey. And because of that, I prefer it in lesser amounts and when it is served with something relatively clean. That is why I made the risotto quite light and didn’t add extra butter to enrich it or anything like that. Speaking of risotto, guess what I will be doing for next weeks recipe? I will be using this risotto mixture to make street food inspired arancini balls (risotto rice balls). So you could totally store away some leftover risotto in the fridge if you want to make those. You won’t regret it if you do. So thanks for checking out my recipe lovely people. I will have that Arancini recipe posted soon. 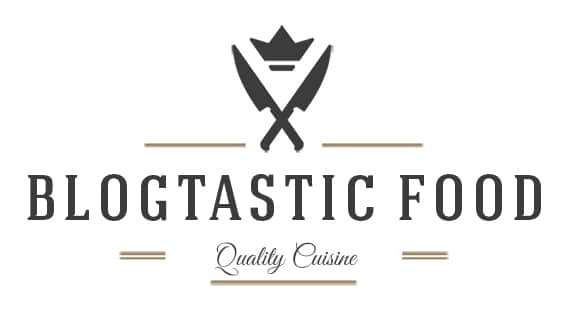 To stay updated with new posts and recipes, make sure you subscribe. Other than that, have an awesome day. Light, herby, creamy risotto. Topped with amazing medium rare pan-seared duck. Hope you enjoy. Pre-heat a large pot to medium heat. Add your olive oil to the pot, then add your onions, garlic and celery. Sweat for a couple of minutes and be careful not to brown the ingredients. Add your Arborio rice and mix through. Then, turn the heat down to low-medium heat, add your white wine. Once the white wine has evaporated, add about 200mls of the stock and stir occasionally. Keep adding another 200mls every time the stock in the risotto mixture has evaporated. Keep the heat down nice and low, once all of the stock is added the rice should be cooked. At this point, you want to turn the heat off. Then, add your parsley, basil, mint leaves, thyme, parmesan cheese and a pinch of black pepper. Set aside a re-heat when ready to serve. Pre-heat an oven to 200 degrees Celsius. If the handle on your frying pan is plastic, then put a baking tray in the oven to pre-heat. If you have a pan with a metal handle, don't bother with the baking tray. Score the fat of the duck with sharp knife. 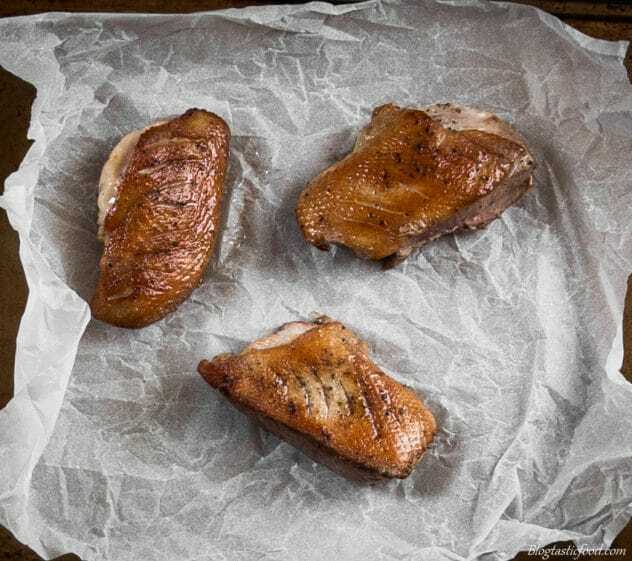 Season the duck breasts on both sides with a generous pinch of salt and pepper. Place the duck in pan cold frying pan fat side down, then place on a stove on high heat. As the pan heats up and the fat starts to render, fry for about 3-5 minutes until the skin goes crispy. Flip the duck over and sear for 1-2 minutes in the other side. Once again, if the pan has a metal handle and can go in the oven, flip the duck back on the skin side and put the pan straight in the oven. Otherwise, take your pre-heated baking tray out of the oven, put the duck skin side down on the tray, then put back in the oven. Cook the duck for 5 minutes, remove from the oven then let the duck rest for a couple of minutes. While your waiting, just re-heat your risotto and get it ready to serve. 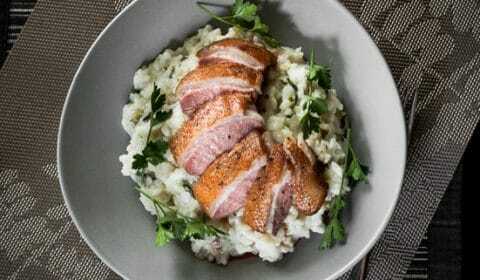 Slice the duck into thick strips, ladle some of the risotto on a plate, then lay the pieced of duck neatly on top of the risotto. Remember to start frying your duck fat side down in a COLD pan. The fat on a duck breast is thick and frying it by starting it off in a cold pan will help render the fat. You don't need to add oil to fry the duck, there is already enough fat on the duck. Nick, this looks really delicious! I rarely do anything with duck, but when I do I usually cook it using some asian recipe, same as you. 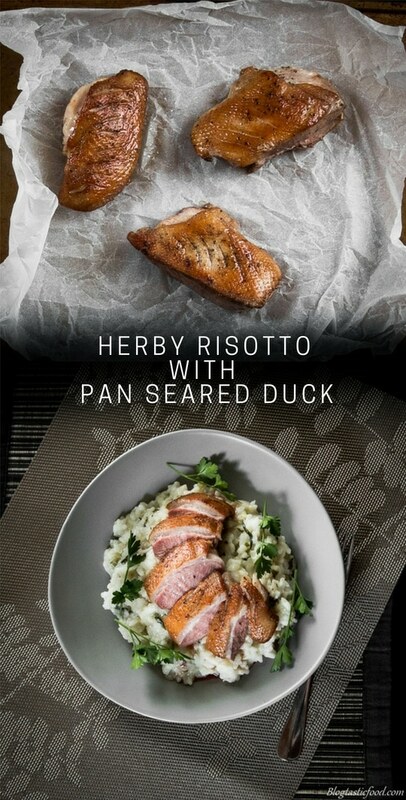 But I’ll tell you, next time I see duck meat-I’ll make this risotto. The duck looks so perfect! I love duck .. any part. And with the risotto, you have a very elegant dish.